I've said it before and I'll say it again. 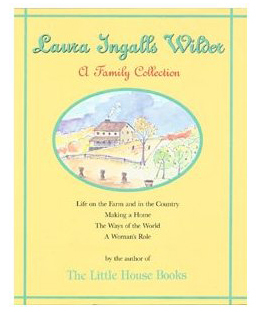 I am fascinated with frontier/prairie/farm life and the Laura Ingalls Wilder Little House book series. I love them so much I made sure my own little "half-pint" had her own collection of the books and we have been going through them one by one at bedtime every night (we're now reading the final book - The First Four Years). I also bought The Little House Cookbook - mainly so The Girl and I could make Vanity Cakes and the doughnuts Almanzo's mother made. When I came across A Family Collection by Laura Ingalls Wilder at the thrift store (for $1.81) I had to buy it. This book is a collection of articles and stories written by Laura for the "Missouri Ruralist" (a widely-read farm paper) between 1911 and 1918. Not only does it give a glimpse into some of Laura's life after the Little House books, but it also gives a closer look at farm life in general as well as Laura's thoughts on social changes (such as women's rights) and historical events (the war). I have been enjoyed it immensely. You can find a used copy for very little on Amazon.com. But of course, you don't HAVE to have the book to read the articles. You can find the eBook online at Books-A-Million.